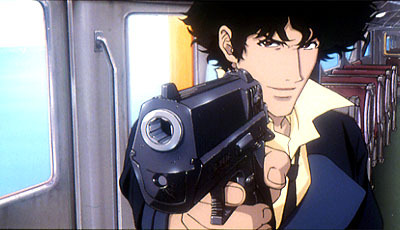 The film version of ‘Cowboy Bebop’ which is one of the brightest series of Japanese TV animation, ‘Cowboy Bebop -the Heaven’s Door- opened on September 1st. The space cowboys of 4 guys and a dog came back to the stage of Mars in 2071. The speedy actions, live rhythm of jazz, cool and comical characters actively perform in the drama. This entertainment work, ‘Cowboy Bebop’ on the big screen has its own dynamic taste. On Mars in 2071, an explosion occurred on the highway of the crater city ‘Albacity’ just before Halloween. It is terrorism with an unknown bio-weapon. The government of Mars offers three hundred million woolong prize for the terrorist’s capture. The poor crew on the Bebop started to chase him as they usually do (with the worst teamwork). The information reveals criminal’s name is Vincent who should have been dead. The mysterious Vincent does not have feeling and reason. He is the strongest and invulnerable. Also there is a woman Extra chasing him. Is it possible for the space cowboys to win? Their groovy way to live just with their desire! This work shows life in our confusing reality without confidence or speed. That is ‘Cowboy Bebop’. The wonderfulness with their confidence is in their action such as walking in the city, running, sleeping, eating… each scene is fully expressed in this film. This Bebop has soul of the staff. You do not have to think anything, just feel it with your eyes and ears. The 13 stories of ‘Cowboy Bebop’ were broadcast by TV Tokyo in April 1998. It attracted many people, and the full 26 stories were on Wowwow (a Japanese BS channel). Many of you should be shocked by it. The impact of opening with hone was enough to give you a conviction the new animation of world. The opening tune is wild and splendid. It is by ‘Sheet Belts’ with Yoko Kanno who moved animation soundtracks into th emainstream. The recording sold more than seventy thousand copies, and the first soundtrack won the Japan Gold Disc Prize in 1999. They released new work for this film. The music is a necessary aspect of ‘Cowboy Bebop’. Another fascination of this animation is its setting in 2071 in which people live on planets beyond the earth. It does not show a bright future. On the contrary, it describes spoiled and corrupted cities well in order to make the reality of running, fighting, eating by the characters expected. The city is full of billboards and has a taste of Hong Kong, and the landscape with stone pavements is like one from Europe. The high buildings make an atmospheres like in New York. The mixed details from each city imply that people cannot forget the Earth. The Moroccan landscape is in this film and it gives it power for version up the cosmopolitan mood. Morocco has a mixture of culture from Europe, Africa, and Middle East. The report in Morocco by the main staff gives depth to this film. The character design by Toshihiro Kawamoto gives life to people in the cross-cultural age, and the mechanical design by Kimitoshi Yamane describes the machines running. The original CG expression in the TV version narrates the world with these machines. With the background of impressive views of the world and sound, Spike, Jet, Fey, Ed and Ain, a dog, fight violently with many criminals moving lots of planets in the solar system. It is Shinichiro Watanabe and Noriko Nobumoto who make the characters play the best drama having (too much?) personality. The story has been cool, comical, or even with Japanese soul. The 26 stories of the TV version have a strong narrative as well as a lot of new aspects of expression. Of course, the most attractive point of ‘Cowboy Bebop’ is the strength of the story that will be never worn out. It is great for us to have such a working dream.